I adore this little WSD duck....and have popped up the umbrella onto dots. You can't tell from the photo but his beak and feet are glossy-ed up and look adorable in person. Such a (hopefully) cheery little get well card! 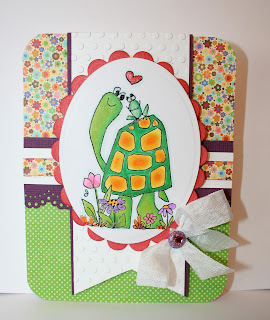 For my second card I also went WSD with a cute image that I thought was perfect for my little kindergartner lunch pal! The flowers and heart are also glittered with pen as she LOVES sparkles! And, finally, the eyes are glossy-ed up and really POP in real life! These are both so very sweet! I adore bright colors too! Your little lunch buddy is sure to love this! Have a great day! I can just imagine the smile on your little lunch buddy's face when she sees this :) So cute! And I really love the ducky card too with that popstage stamp die- awesome! These are great - love the bright colors! Adorable cards, Sheila! I just know that little gal loved hers. And, I truly understand when blogging takes a back seat. My cardmaking time is very sporadic and when I do get a chance to post it takes a LONG time to catch up with the blogs I follow. But, I love doing so when I can. Love seeing what others do; so much talent out there!! Your colorful and happy cards alwasy bring a smile to my face. soooo cute Sheila. Just love the bright colours. Sheila your cards are a sure sign that spring is just around the corner. Thanks for sharing your colorful happiness! Beautiful, Sheila! Love the sweet images and the bright, happy colors! Thanks for joining us at Mojo Monday!